What a hectic week this has been! I’m exhausted and I’m so looking forward to the weekend, and this one in particular! It’s my birthday this Sunday and Duncan is treating me to a break in breathtaking Santorini where I will be able to put my feet up at last. And what an idyllic place to do that in! It’s such a thoughtful present and although the hammock I got last year was his best b’day present yet (I love sinking into it at sunny weekends with a book and a coffee in hand), this is a close second! Duncan hasn’t always been that intuitive when it comes to present choices. One memorable Xmas, he presented me with two beautifully wrapped boxes. I was excited. We’d only been going out for about a year or two at that point, so I was secretly hoping for something romantic. I went for the larger box first. My smile quickly morphed into a confused wince as torn wrapping paper revealed an electric power drill! I somehow managed to keep my graces and I swiftly moved to the smaller box. This must be it, I thought. Imagine the horror on my face when I discovered that the smaller box contained a 64 piece drill bit set to go with the power drill!!! He said he was agonising over whether to get the 128 piece set instead (Duncan here: it turned out the 64 was fine, I wouldn’t bother with the 128)! His rationale was that as I was a brand new home owner, a power tool was exactly what I needed to help me accomplish all the DIY I was planning on doing. He was right, it did prove very useful over the course of all our DIY projects and he never failed to bring up what a great yet massively undervalued present it was. Fair play! I’m so glad we can laugh about it all now! 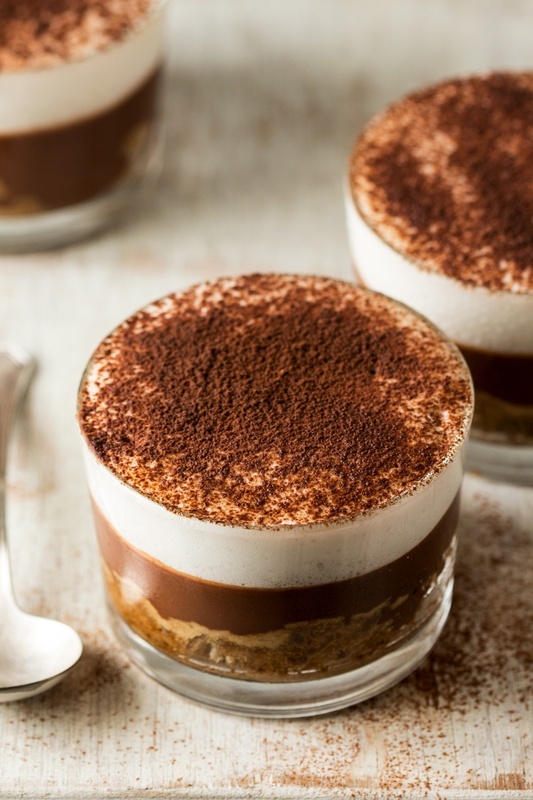 Today’s recipe is a vegan tiramisu as I am a coffee fiend and I’ve had an idea for it banging around in my head for a while. It’s easy to make and a pleasure to eat. I made mine in small glass ramekins as that’s what I had to hand, but you could also double the ganache and cream quantities and go for a largish (20 cm / 8″ square) tin instead. Just remember to allow a few hours (4 hours to be on the safe side) for the cream to set and keep well chilled until you’re ready to serve. PS: If you make my vegan tiramisu, don’t forget to tag me on Instagram as @lazycatkitchen and use the #lazycatkitchen hashtag. I love seeing your takes on my recipes! Heat up the oven to 170° C (or 150° C fan forced) / 340° F (300° F fan forced). Grease a baking tin (20 cm / 8″ square) with a very small amount of oil. Whisk the first five ingredients in a large bowl with a wire whisk. 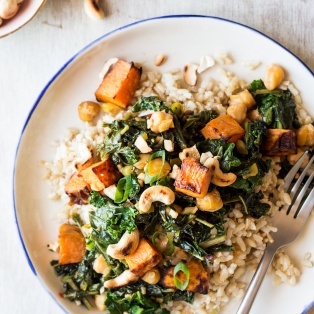 In a separate, smaller bowl combine the remaining three ingredients. Gently fold the dry ingredients into the wet ones. Take care to fold them in very gently or else the sponge will be tough. Bake for about 35 minutes until a toothpick comes out clean and the top is nicely browned. 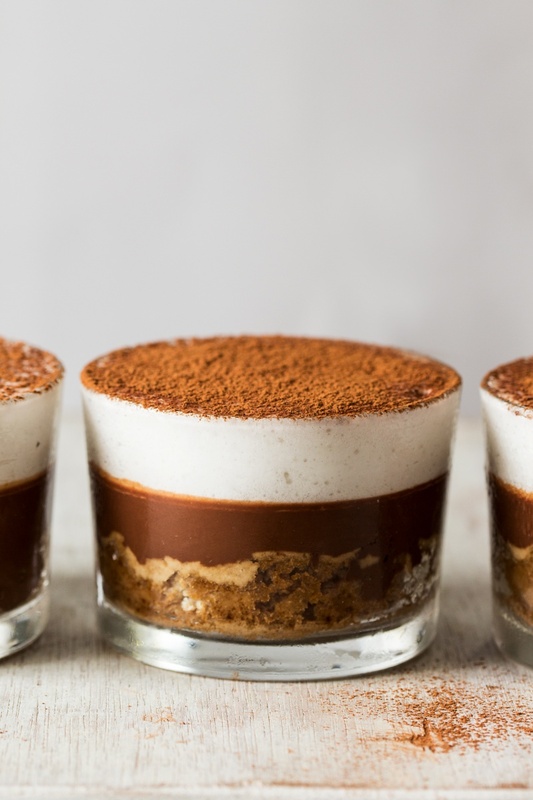 Once cool, remove the sponge from the tin and cut to the shape of your tiramisu glasses. Place a circle of the sponge at the bottom of each glass. Soak the sponge with about 1 tbsp of strong coffee per glass (60 ml / ¼ cup in total). Place the chopped-up chocolate, almond milk and 60 ml / ¼ cup of cooled coffee in a bowl over a water bath. Set the hob on the lowest setting and allow all three to melt into each other. Do not stir until most of the chocolate has melted. Gently mix the two together with a wire whisk and take the bowl off the heat to allow it to cool. Once the ganache is cool but still pourable, divide it evenly between the 4 ramekins and place them into the fridge for about 1 hour to set. Place chilled coconut cream in a bowl and give it a brisk whisk with a wire whisk so that it’s smooth and lump free. In a large bowl, whip aquafaba and vinegar until you get stiff peaks – to check, invert the bowl and watch if the whipped aquafaba starts sliding down, if it does continue whipping until it no longer does. With my handheld electric whisk, it takes approximately 5 minutes for this amount of aquafaba. Once at stiff peaks, start adding sugar very gradually while whipping. Adjust the amount of sugar to taste mindful of the fact that the chocolate layer is fairly unsweet. Whisk in the xanthan gum. Very, very slowly and gently whisk the coconut cream into the aquafaba with a wire whisk. The mixture will deflate a bit but don’t worry, it’s normal – once chilled the fat in the coconut cream will provide structure and a nice mouth feel. Top the set chocolate-coffee cream with the layer of cream and put the ramekins into the fridge (for about 4 hrs) to set. Keep refrigerated until you’re ready to serve. *To make this dessert gluten-free, substitute wheat flour with a gluten-free cake mix. 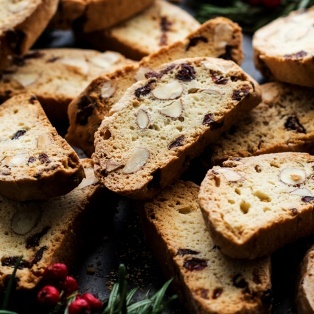 **Traditionally a mixture of strong coffee and Marsala (sweet red wine) is used to soak the sponge. I didn’t have any suitable alcohol in my cupboards so I did without it, but you may want to use marsala, brandy or dark rum. The sponge recipe is adapted from this earlier recipe. Chocolate coffee cream is adapted from this earlier recipe. Cream is adapted from this earlier recipe. I want to try this this weekend.. What did you use for the dusting on top? 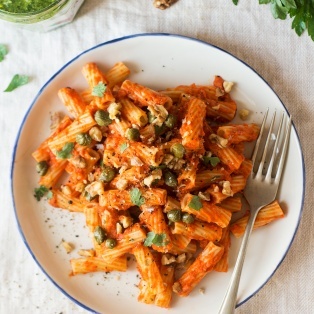 Thank you for sharing your wonderful recipes on your lovely blog. Yumm this is a very creamy and tasty recipe. I may have to make extra spongecake next time just to enjoy by itself it’s so good! One tip for making: Clean your whisk between whisking the coconut cream and the aquafaba. I didn’t the first time and my aquafaba wouldn’t inflate, I think due to the coconut oils on the whisk! Thank you so much for your wonderful-sounding and looking recipes! I’m excited to try some of them. 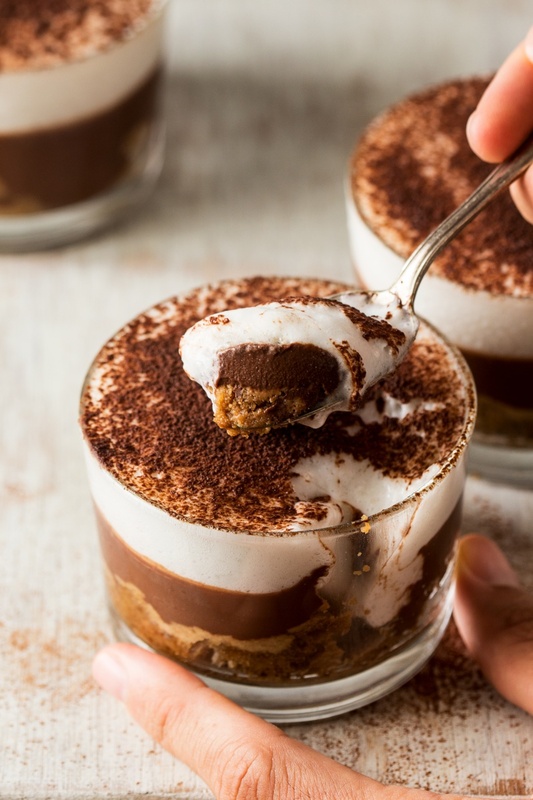 I have a question on the Tiramisu – I noticed that the cream layer is made up mostly of coconut cream and I’m wondering if you taste a lot of the coconut taste – or does the chocolate layer counteract it enough? I’m not a big coconut fan. Looks great. I’m curious if you can make this ahead of time? 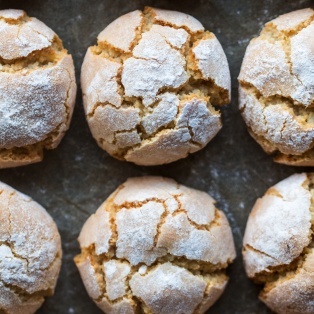 Does the cream layer “flatten” easily, since it is made with aquafaba? Ideally I would like to make this day before, if it can hold up. Your coffee amounts are confusing. The ingredients for the chocolate coffee layer include half a cup whereas the method states a quarter of a cup. Is the spare quarter of a cup to be used to soak the sponge? Hi! I just made this and the flavours are fantastic! 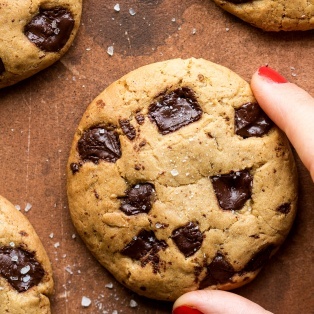 I will definitely make it again – it’s an easy treat and everyone has loved it so far. However, it was actually impossible to get the coconut cream “smooth with no lumps” – I tried everything. Should it be at room temperature? I had mine straight from the fridge. So the top is essentially coconut cream bits held together by aquafaba. Any tips would be appreciated. It tastes great but the top “cream” layer is kind of weird. Hi, this recipe looks amazing. Just wondering, with the chocolate ganache layer, does it harden by the time you go to eat it, or is it soft and smooth. Given that this dessert needs to set in the fridge, I wanted to know if this will mean the chocolate layer becomes hard and difficult to cut through? This looks delicious! I’m thinking of making individual ones in shot glasses for a shower I’m hosting. I normally use coconut sugar in all my baking. Woukd that work, or should I buy granulated sugar. Also, woukd almond flour or whole wheat flour be okay? Hi Ania, is it possible to make it gluten free? I’ve tried the recipe a few times and it was delicious.